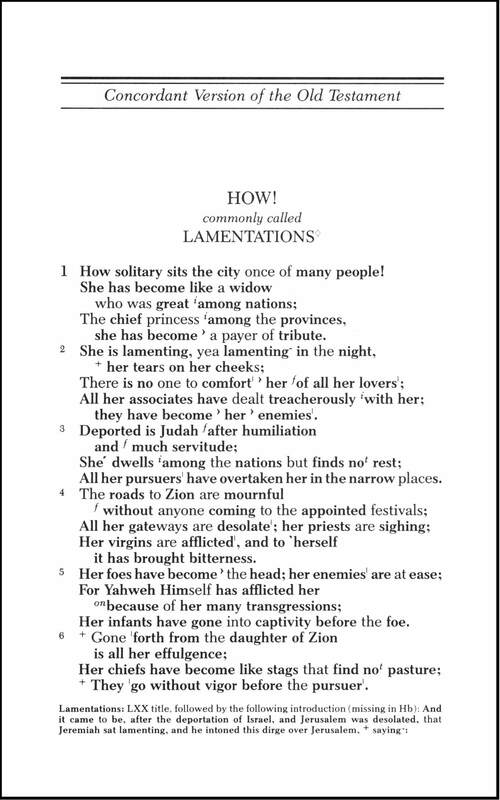 The CONCORDANT VERSION of the book of Lamentations. The CONCORDANT VERSION of the book of Lamentations is presented here along with notes selected and adapted from a study written by Vladimir Gelesnoff. What is startling in this book is not simply the horror of Jerusalem’s devastation but the fact that this has come upon the very people and city marked out from the rest of the nations by special divine favor. These sorrows are traced to the divine activity of God Who is being revealed through the pains and sorrows of temporary affliction. The principle of God’s faithfulness in the midst of sufferings remains as vivid and meaningful to us as it was to the people of Judah so long ago.